Adding a festive twist to your food and drink is an easy way of making sure that anything you serve complements the time of year. For drinks that use a lot of steamed milk like a latte, cappuccino or flat white, your best bet is to add a squirt of Monin syrup. Don’t worry though, it’s easy to assume that syrups are crammed with harmful additives and heaps of unnecessary sugar but this isn’t true with Monin. Their hazelnut syrup contains no fat, no cholesterol and no artificial preservatives. Chocolate is extremely versatile and has the ability to change the look and feel of almost any dessert. With just a few simple pieces of equipment and some chocolate, you can quickly and easily create your own chocolate monograms. Draw your Christmassy shape onto a piece of baking paper or acetate. If you whip your cream in-house then this is another really easy trick. 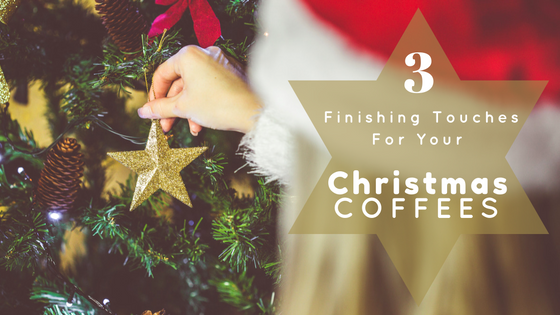 Like the others, you can do this all year round, but it is perfect for use around Christmas. Just take your cream, pop it in an airtight container (or keep it in the one it came in if it’s resealable) and add the spice or food you want it to absorb the flavour of. Seal it up and let it sit overnight in the fridge. By the morning, the cream will have taken on a tasty hint of the flavour and it can be strained, ready for whipping or used in an espuma gun.